The book is divided, of course into four sections. The total number of pieces included is forty-four, each composed of four parts; although section three has only ten stories, section four has twelve to make up the difference. 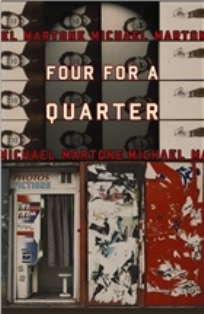 One of the forty-four pieces concerns an interview Martone gives on the phone at home in Tuscaloosa, while the Blue Angels—four of them—zoom overhead in various formations of four. He is asked what is the difference between fact and fiction and he answers, “A fact is a thing done and a fiction is a thing made so that even the most real thing, after it is done, has no reality, and … the most made-up thing, when it is made up, has a reality—the reality of a book, say, of words on paper….” So this book is a collection of fiction, things made up. But it is not the fiction of conventional story, with rising action and epiphany, perhaps, or a novel, in which one can lose oneself, become immersed in nineteenth-century Russia or the running of the bulls. This is post-modern, experimental flash fiction, with an emphasis on cleverness and language. This subgenre is not for everyone, obviously, and by no means should readers read the book quickly, like a reviewer. Read one quartet at a time, enjoy. Cleverness cloys in quantity. Many are beastly clever. In a quartet that takes place on a revolving bar, the four sections are about eating from the nut bowl, first the cashews, then the filberts, then almonds, finally peanuts. Each section is longer than the previous, the “peanut” section, of course, longest of all. You cannot imagine how many fours there are. Threes are reputed to be ubiquitous, trinities and all that, but fours rule: seasons, humors, the faces on Mt. Rushmore, the internal combustion engine cycle, four dead in Ohio. He even includes the University of Alabama’s four antebellum structures: The Gorgas House, The President’s Mansion, The Old Observatory, and The Little Round House. There is also an element of Rashomon here: four takes on or interpretations of the same events, seen from different angles. In the Audie Murphy “To Hell and Back” section this is combined with some elements of meta-fiction—fiction about fiction, imitations of imitations. The decorated hero, Murphy, is in a theatre watching the movie about his life, in which he starred. “It looks like a battle in a movie because the battle I was in looked like a battle in a movie staged and choreographed the same way,” he says. Art imitates life, which imitates art, and so on and so on.